Lessolungo Blackwell Passmore, age 60, of West Virginia, went home to be with the Lord November 24, 2014. Lessolungo was born to Martha and John Airy Blackwell on August 15, 1954. Lessolungo was loved by her family and community. She was a member of Church of Christ. Lessolungo was vibrant, creative, full of life and multitalented in so many things. Her hobbies were plants, sewing, gardening and traveling. 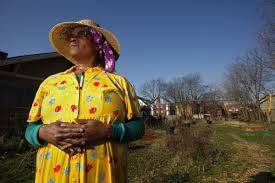 She was an activist in the community, in charge of the Bird Sanctuary on 5th St. in Columbus, Ohio. She graduated from South Western College with honors and also loved exotic foods from all countries. Lessolungo is survived by her sisters Sabrina Taylor and Pat Boykin, a brother, children Tameeka Haislip Reeves, Laneeka Haislip, April Haislip, Beauford Booker, Aaron Booker and Kelli Reese, 19 grandchildren and a host of other family and friends. In loving memory of her we will cherish and keep her past memories shared and in our hearts with Ms. Leslie. We will surely miss her joy, smiles and laughter. Visitation 1:00pm and Funeral 2:00pm Wednesday December 3, 2014 at MARLAN J. GARY FUNERAL HOME, THE CHAPEL OF PEACE 2500 Cleveland Ave.
At a Time like this we ask our selves why Did our Father GOD would take some One Home so soon? BUT GOD sometimes has to feel a spot in HIS HEAVENLY CHOIR!! SO HE CALLS A GREAT SINGER HOME! SOME ONE WHO CAN FEEL SUCH A LARGE REQUEST! !